Venice is the “perfect” setting for weddings. ​I spotted this handsome couple posing for photos while we were having lunch on Burano Island. Venice is our favorite city. We enjoy a relaxing walk to find that special, quiet little restaurant along the narrow streets or a small canal off the beaten path, away from crowds on the Grand Canal. There is always a different church, square, market, or a shop to explore. My wife loves hand made paper books and note pads, high quality, Italian leather gloves and handbags. Each year there are new, "must have", handbag designs. From your ship in Marseille France, it's an hour drive to Carrieres de Lumieres, an abandoned limestone quarry carved into a mountain. You enter a huge cavern with white walls 30 to 50 feet high. 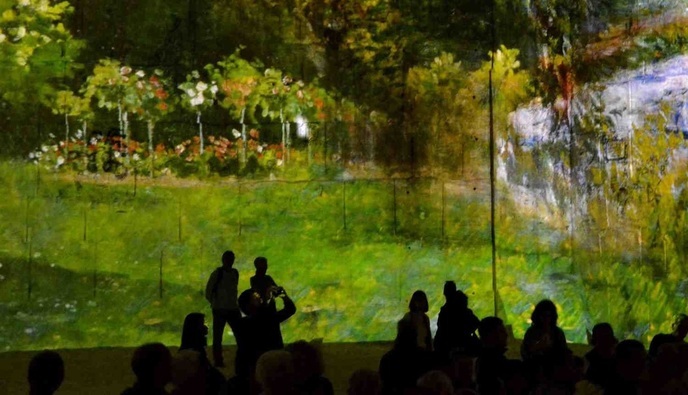 There are no lights except projectors displaying paintings. Music plays softly as the paintings move along the walls. A Private “Photo Shoot” of a Beautiful Island on Your Shore Excursion! 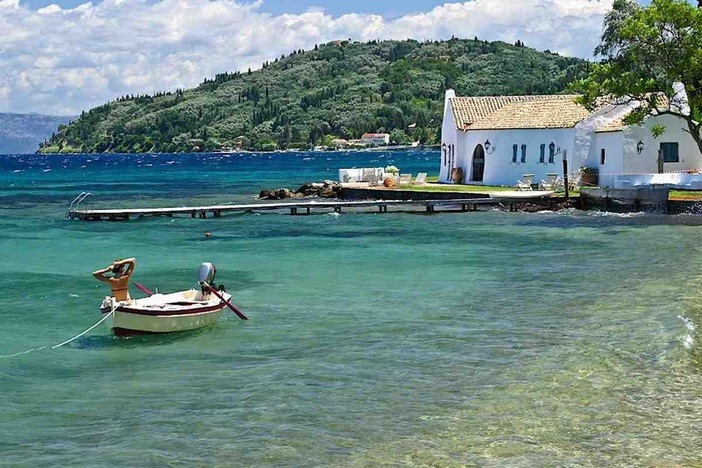 Corfu Greece is a gorgeous, “picture perfect” island. Note the Boukari Beach photo at left by Vangelis Koulouris. Imagine the possibilities for a “photo shoot” on your private tour of Corfu. Vangelis will help you "see the island though a photographer's eye" with tips on where, and how, to take postcard photos. Corfu tour companies and guides have similar names. To get Vangelis as your driver/guide, book a tour with Spiros Kritikos, owner of Corfu Taxi Tours at http://www.corfutaxitours.com/ and ask for Vangelis, the professional photographer. ​Istanbul is one of the most impressive cities I have ever visited. The mix of culture, history, and sites is amazing. 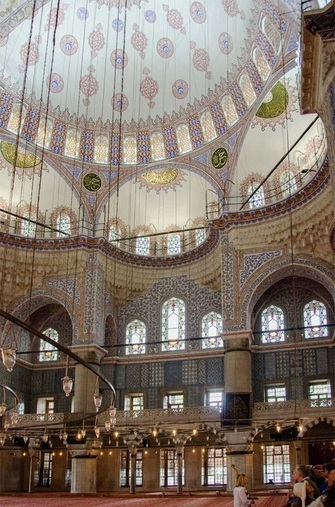 The Sultanahmet Mosque (Blue Mosque) is incredible (photos below). 2) Travel options to visit multiple tourist sites from the cruise port. Walk 0.75 mile, or take a cab, from the ship to Casemates Square. Relax at the cafes and shops. Continue walking 0.9 miles south along Main street through the major shopping area with 113 stores, past the Governor's Residence, and Trafalgar Cemetery to the cable car. Take the cable car to the top of the mountain for breathtaking views from the “rock”. Photograph the barbary apes, but be careful, they can bite. You can explore much of the area on foot, but you'll need to join a taxi van tour to see all the sights including St Michael's Cave, the Siege Tunnels, the Lighthouse, etc. Taxi tours are available from the cruise ship dock, Casemates Square, or Trafalgar Cemetery. There are also boat tours for dolphin and whale watching. ​Cartagena was an important, and prosperous Roman Colony in 54 BC. The main dock is in center city; the alternate dock has a shuttle bus to center city. My walking tour map shows all the sites. It's 1.36 miles round trip. Visit shops, cafes, restaurants, churches, museums, and the Roman Theatre, along Calle Mayor, the main, marble-paved, pedestrian walkway. Stop at the Roman Forum, the Crafts Centre, Augusteum, the House of Fortune, and take the Panoramic Lift to Conception Hill. Take the blue public bus or the ship's shuttle to Columbus Statue, the starting point for your walking tour. Walk north along La Rambla. Stop at the Food Market “Mercat St Josep La Boqueria”. The Gothic Quarter is on the east side of La Rambla. Visit the Historical Museum and the Cathedral. It's a 0.8 mile walk along La Rambla from the Christopher Columbus statue to Placa de Catalunya, the center of the city. You'll need transportation to visit many tourist sites. HopOn buses are inexpensive and go everywhere. Two popular sites are Parc Guell and Montjuic. You can take a cable car from hill in Montjuic down to the harbor, not far from the Columbus Statue. Sagrada Familia church by Gaudi is a must-visit. Book tickets in advance of your cruise because priority admission in the morning is for organized groups and pre-booked tickets. Ships dock five miles from the city. Take the ship's shuttle bus to Vieux Port where you can spend all day exploring the area on foot. Public transit is excellent to tour a few sites outside the city. Buses depart ~ every 5 minutes to Aix-en-Provence which is ideal for self-guided touring. Cassis can be reached by train, but you'll need a cab to the beach. To expand your reach to more distant scenic villages, hilltop historic towns, vineyards, etc., I recommend a pre-arranged private van tour such as the one described in the port guide. ​Cruise ships tender passengers into the harbor in Cannes. It's a short walk to the tourist sites in Cannes in a small area near the harbor. Many cruisers take a train to Nice, a large city that's perfect for self-guided touring with many things to see and do. Although it''s possible to visit small villages and tourist sites via public transit from Cannes, I prefer a pre-arranged private van tour as the most time efficient, no-hassle travel method to visit St. Paul de Vence, Eze Village, Grasse, etc. Monaco is a tiny county measuring 0.78 square miles. It has the highest per capita income in the world! It's home and the playground for the rich and famous. Your ship might dock, but most ships tender passengers in. Stop at tourist information next to the dock to get discount coupons for tourist sites. Follow my step-by-step walking directions from the dock to the elevators to the top of the mountain. Visit the Oceanographic Museum, Cathedral, and Palace. Then take a public bus to other sites in Monaco. There is train and bus service to other cities e. g., Nice. It's a beautiful, tiny village next to a well protected, deep-water harbor where cruise ships anchor and tender passengers ashore. There are some tourist areas in the village. Most cruisers take the train or public bus to other areas such as Nice and Monaco. NOTE: Train ticket vending machines require exact euro coins or a credit card with a chip. Livorno provides access to some of the most spectacular tourist sites in Italy; namely, Florence (Firenze), Pisa, Lucca, San Gimignano, Siena, Cinque Terre, and more! It's a large industrial port that is not conducive to self-guided touring. You'll waste ~ 90 minutes round-trip waiting/riding a shuttle bus between your ship and Livorno centre city. This reduces the time you have for self-guided touring and limits the number of places you can visit. To maximize your time at tourist sites, choose a tour that departs from the ship and travels directly to the tourist sites. Consider the ship's bus tour, a private pre-arranged tour in a bus, van, or rent car at the port. See my CHOICES web-page for a comparison of shore excursion options. Also, there's an excellent website LivornoNOW by my friend Sarah Thompson. It's packed with detailed information on touring from Livorno and about the city of Livorno itself. Civitavecchia is a large port. For self-guided touring of Rome, take the free shuttle bus from your ship to Civitavecchia and walk (0.9 miles) or take a bus (2.0 euros) to the train station. My guide has detailed information on train travel, all the train stations, walking tour maps of Rome plus metro, bus, and HopOn bus routes. Rome is excellent for self-guided touring. NOTE: book tickets on-line for museums in Rome before your cruise. For time efficient travel to other tourist sites such as Tarquinia, Villa del Marta, Tuscania, Villa Lante, Bolsena, and Orvieto you'll need the ship's excursion bus or a pre-arranged private van tour. PLAN AHEAD! BOOK YOUR TRANSFER EARLY from Civitavecchia Port to Rome. Otherwise, you may have a 4 to 6 hour wait for a taxi to Rome. This guide describes the issues and transfer options. You can extend your vacation another memorable day by combining a private tour to some of the most beautiful sites in Italy with a transfer that drops you off at your hotel. If you are flying home the next day, consider a hotel in a quaint fishing village on the Tiber River next to Leonardo da Vinci Airport. It’s a scenic area to explore on foot, has many restaurants, and the taxi ride to the airport avoids the heavy traffic you would encounter from a hotel in Rome. Cruise ships dock downtown in Naples close to transportation by boat, bus, or train to popular tourist sites. Some ships anchor in the harbor at Sorrento which is a better starting point for self-guided touring because it's closer to most of the tourist sites. My guide includes maps, aerial photos, and street level photos with turn-by-turn walking directions. Self-guided touring is easy to sites in Naples, Capri, Herculaneum, Pompeii, and Sorrento. However, I recommend the ship's tour or a private, pre-arranged van tour to drive along the Amalfi Coast to the villages of Positano and Amalfi with a stop for lunch in a small restaurant overlooking the sea. As long as you do not have problems walking up/down shallow steps to cross “dozens” of small bridges, Venice is “perfect” for self-guided walking tours and boat rides. Take the "People Mover" monorail near the cruise ship to Piazzale Roma to begin your self-guided tour. You can walk and use vaporetto (water buses) to explore sites. Venice is one of the most romantic places in the world! It's an amazing, wonderful place for picture perfect views, fantastic shopping, outstanding food, impressive architecture, rich history and art, grand plazas, majestic churches, and more! My guide includes walking tour maps for Venice, Murano, and Burano islands plus vaporetto boat routes. Take the ship's shuttle bus or a public bus 2.5 miles to Old Town. It's one of the world's finest and best preserved medieval cities. Defensive walls, up to 18 feet thick and 75 feet high, protected the city for a thousand years with 5 forts, 16 towers, and bastions. It's old, but it's a lived-in city with homes, shops, cafes, restaurants, and hotels. Bazaars and markets are open in the summer. Red roofed buildings are attractive and there are Baroque churches, museums, palaces, monasteries, etc. It is a must visit, pedestrian friendly town. It’s a spectacularly beautiful port with a gorgeous “sail in” through the bay surrounded by steep mountains lined with historic buildings, churches, towers, docks, and marinas along the shore. Kotor has a rich history as a heavily fortified commercial port since Medieval times. It was one of the most important trading centers in this area of the Adriatic Coast. The people are friendly and welcome tourists. Sveti Stefan is one of the TOP 10 glamorous A-list destinations in the world. Budva is known as the metropolis of tourism. We spent an hour on a walking tour of Medieval Old Town "Stari Grad"
Our Lady of the Rocks is one of the most popular tourist sites in Montenegro. Perast is one of the most beautiful little places in Boka Bay. We had lunch on our own next to the bay. Kotor is rated #1 as the Best Travel City for 2016. We had 30 minutes for a walking tour before returning to our ship. The main tourist site is Olympia, 25 miles from the ship. You can also use the ship's bus tour, the train, or rent a car. ​Olympia was a sacred site for worship of Zeus and the gods. Around 776 BC, the first Olympic games were held there. The tourist area consists of the archaeological ruins at the site of the games and worship of the gods. The museum contains well-preserved masterpieces. My guide describes travel options to Olympia and detailed, walking tour maps of the site. "If you have extra time in the Katakolon port area, visit cafes and shops near the cruise dock and there are two private museums on opposite sides of the road near the soccer field. One covers ancient Greek technology, the other features Greek musical instruments. Both are very well done and took around 45-90 minutes to see. They cost 2 euro each." Comments by Alan Gauld. 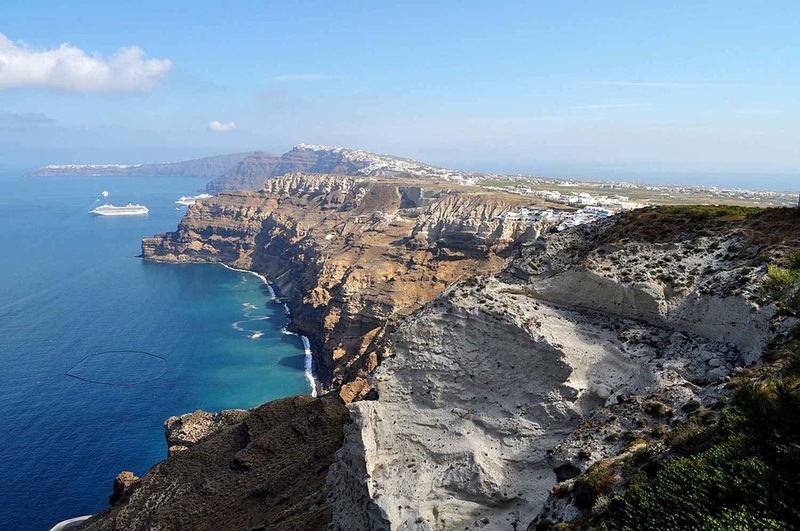 A popular self-guided tour is a speedboat from the tender dock that includes a bus ride up the cliff to Oia, the most popular tourist site. After your individual walking tour, the bus takes you to the cable car to descend the cliff back to the tender dock. Rental car touring is my preferred option because the island is only 10 miles by 3 miles. I can drive everywhere and it's hard to get lost. Taxis are an efficient way to travel, but when a taxi drops you off in a village, be sure to arrange to have the driver pick you up at a specified time to return to the port area. Public buses are OK but they tend to be very crowded. Sailboat and powerboat tours must be booked in advance. My guide includes maps and detailed turn-by-turn walking directions to explore the island. If your ship anchors in the harbor, the tender will take you to the center of town. If your ship docks, take the ship's shuttle bus, not the public bus, to town center. The public bus does not have the capacity to handle all the people returning to the ship at the same time in the afternoon. Mykonos is a “picture perfect” island town. It's ideal to explore on your own. Take a leisurely walk exploring the narrow streets, visiting shops, and taking postcard photos. Visit the windmills and keep an eye out for Petros, the famous Pelican. Relax and enjoy lunch, one of the special Greek coffees, or drinks at a restaurant overlooking the beaches and boats in the harbor. If your ship docks overnight, you'll be pleased to know that Mykonos is one of the hottest night spots in Europe. There are docks for 12 passenger ships in the port of Piraeus, the largest passenger port in Europe. It's 7.5 miles from the port to Athens. You can walk 1.1 miles from your ship to the metro station, or take a HopOn bus from the port, or access public buses near the port. Using a combination of walking and public transit or HopOn buses, you can see most of the sites. I prefer the Athens bus tour at http://www.katakolon-express.com/ to see most of the sites with little walking and no need to transfer between public transit or wait in line for the HopOn bus. My port guide has many maps and public transit routes to plan your shore excursion. To visit sites outside the main Athens tourist area, you'll need the ship's tour or a pre-arranged private tour. Ships dock next to the small resort town of Kusadasi. You can walk into the town for shopping and to visit cafes, a few museums, and restaurants. You will need transportation to visit the historic sites. This is a port where I want a guide to walk with me to explain the historic sites. Otherwise it is not obvious what I am looking at and there are not many signs in English. My port guide covers ten major tourist sites; namely, Ephesus, House of Virgin Mary, Temple of Artemis, St John Basilica, the Museum, Sirince Village, Priene, Miletus, Didyma, and Bafa Lake. Istanbul Turkey - history, a mix of culture, architecture, shopping, and more! 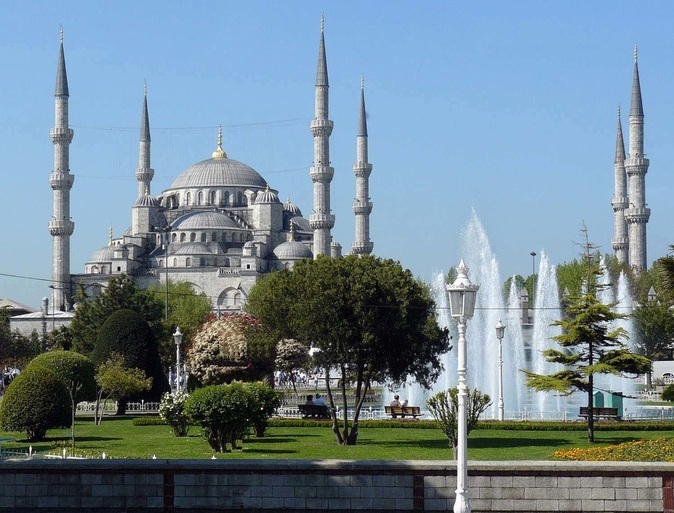 Istanbul is well-suited for self-guided touring. Ships dock 1.2 miles from Galata Bridge. Cross the bridge to the main tourist sites densely packed in a relatively small area. Take the T1 tram from the port to the tourist sites. Note: you'll need Turkish coins (equivalent to ~1 USD) to purchase tokens for the tram. A taxi from the ship to tourist sites is ~ 7 euros. Your ship may offer a shuttle bus for ~ $ 10. Visit the Blue Mosque which rivals the Great Mosque in Mecca, Hagia Sophia, a church turned into a Mosque that is among the greatest houses of worship in Christian and Muslim worlds, Topkapi Palace, the power center of the Ottoman Empire for 400 years and the Grand Bazaar which originated as the world trade center for the Ottoman Empire and is very active today. Enjoy the food, shopping, and consider a boat tour of Bosphorus River. My port guide includes detailed walking tour maps, photos, and descriptions of the tourist sites. © Copyright 2017 Thomas Sheridan www.TomsPortGuides.com All rights reserved.